greyhounds, italian greyhounds, whippets and beyond! How do I choose what coat I need? The standard inner layer fabric is a 200 weight PolarTec® fleece - four times more wind resistant than standard polar fleece and super warm. This is a nice, thick fleece the equivalent of a mid-weight sweater - not a flimsy fleece. 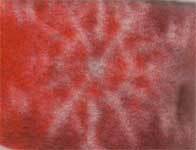 Looking for different colors or thicker fleece? 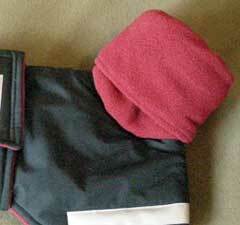 For an alternative to down filling, or a special needs dog, See our Extra Protection Fleece Fabrics - $20 - $40 - $50. See also our "Which Coat Do I Need?" Page. Add a little flair to your custom coat with a beaded, braided, or edge trim! See our Jacket Trims Page for photos. Choose between a double fleece turtleneck collar that can be folded up over the ears (almost like a snood), or a turnback collar. The turtleneck provides the most warmth. Since every coat is made to order, you can ask for a longer or shorter turtleneck to suit your dog's proportions. Many dogs appreciate the warm protection for their vulnerable ears! Some customers have remarked that it's a bit of trouble pulling the heavy turtleneck collar over the head - but it's worth it for winter warmth. However, if quick on-and-off is very important to you, or if you're ordering a light coat, then the turnback collar might be a better choice. 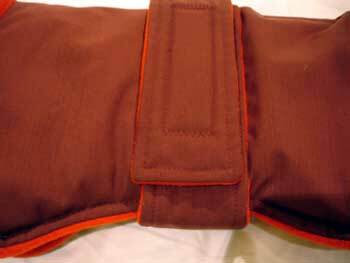 The turnback collar can be flipped back, as shown above, or pulled forward and secured with velcro (see picture below). Blue Willow raincoats and winter coats have waterproof outer fabrics, however, in extremely wet weather conditions, such as prolonged heavy downpours, it is possible for water to enter the seams. 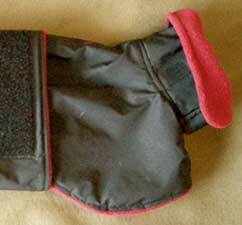 If you anticipate that your pup will be in these conditions, you may wish to order seam sealing. We use a flexible, urethane formula to seal the outer seams of the fabric across the back and (for turnback collars) the neck. 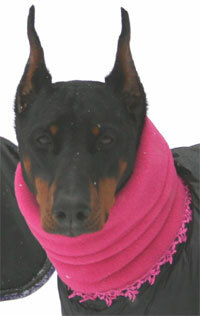 Fleece turtleneck collars cannot be waterproofed. "Mr. Bill's coat arrived - it is wonderful - I think Mr. Bill knows how dashing he looks in it "
"I got it!! I got it!! It is beautiful. It is so much more then I expected. Phil is completely covered. My litle naked guy will be so much warmer. I cannot thank you enough." "LOVE LOVE THE COAT!!! and so does Lucy! thank you so much... you should be very proud of your craftsmanship. It's beautiful, and well worth the wait." Our coats are available in a variety of weatherproof, washable, and FUN fabrics. Our quilted filling provides that extra warmth that these dogs really appreciate on a chilly morning. Other options include an extra warm turtleneck-style double fleece collar (no extra charge) and tummy warmer (no extra charge). Many trims are available for a small additional charge. Copyright © 2007-2010 Blue Willow Whippet Wear. All Rights Reserved. 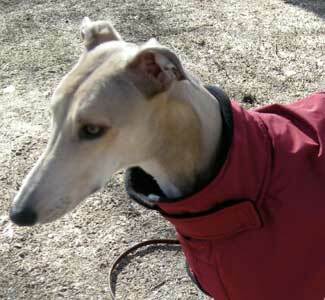 Blue Willow Dog Coats offers custom-made winter dog coats and waterproof raincoats for Whippets, Greyhounds, Italian Greyhounds and all sighthounds. Custom made coats can be fitted for any breed!